This afternoon our family took a walk on the beach. The sun was beginning its descent and casting it light off the waves as they came crashing on to the beach. My DH and I enjoyed the water coming up around our feet as we walked. Big D loved running to miss the waves getting his feet. W sometimes tagged along behind walking in the water and other times walking by her daddy enjoying his company. The tide was out so the sand was solid and wet. 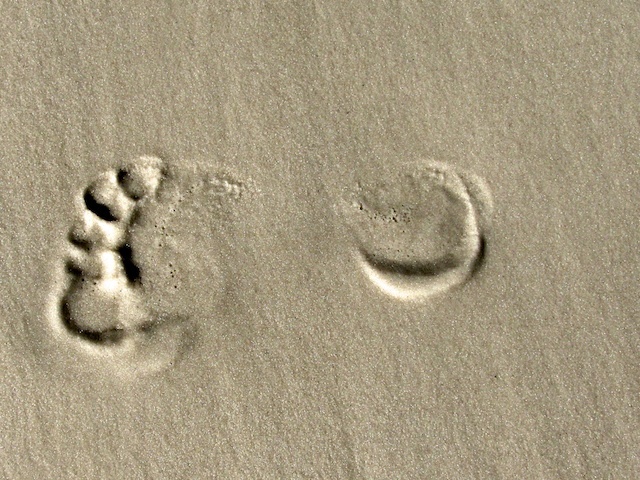 As I followed my DH on our way back to the place where we were staying, I began to watch his foot prints in the sand. They were there and then less than a minute they were gone. The closer I followed my DH the better I was able to make out his footprints and where he was leading us. Isn't that a little like following Jesus? The closer we are to him the better it is to see where he is leading us. The farther away we are the footprints get a little less distinct. Do I see footprints of Jesus each day or am I lagging too far behind that they are disappearing in the sand?